Revocation functionality is essential for the practical deployment of identity-based cryptosystems because a user’s private key may be corrupted by hacking or the period of a contract expires. Many researchers are focusing on revocable identity-based encryption scheme, while revocable identity-based signature scheme has received limited concentration. Recently, several revocable identity-based signature schemes have been proposed. However, these schemes are not scalable and are vulnerable to signing key exposure attack. 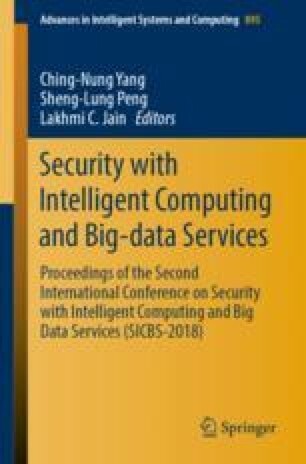 In this paper, we first refine the security model of revocable identity-based signature scheme by considering the signing key exposure attack. Then, we propose a scalable revocable identity-based signature scheme with signing key exposure resistance. Finally, we prove the proposed scheme is existentially unforgeable against adaptively chosen message and identity attacks under the standard discrete logarithm assumption in the random oracle model. This research is funded by Science and Technology Program of Guangzhou (Grant No. 201707010358) and Opening Project of Shanghai Key Laboratory of Integrated Administration Technologies for Information Security (Grant No. AGK201707).